Café Spice GCT of New Windsor, N.Y., is recalling approximately 289 pounds of chicken salad wraps. 15-oz. 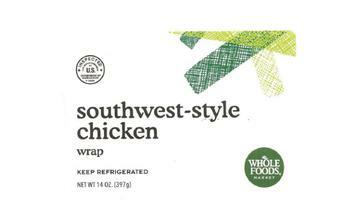 clamshell containers labeled “southwest-style chicken wrap” but containing southwest-style chicken salad products, with a “best by” date of “Jan. 20, 2018” on the labels. The recalled product, bearing establishment number “EST. P-34641” inside the USDA mark of inspection, was shipped to retail locations nationwide. Consumers with questions may contact Lucero Dedios at (845) 863-0910 or at orders@cafespice.com.